This week I have continued thinking about which projects I find to be most interesting. I would prefer to focus on the “ban the bottle” event and the reusable containers for Hamwil. Work with WCSA about adding more hydration stations on campus. If we are asking students to use reusable bottles there needs to be convent clean water they can fill their bottles with. Find out what ChartWells agreement with the school is on water bottles. 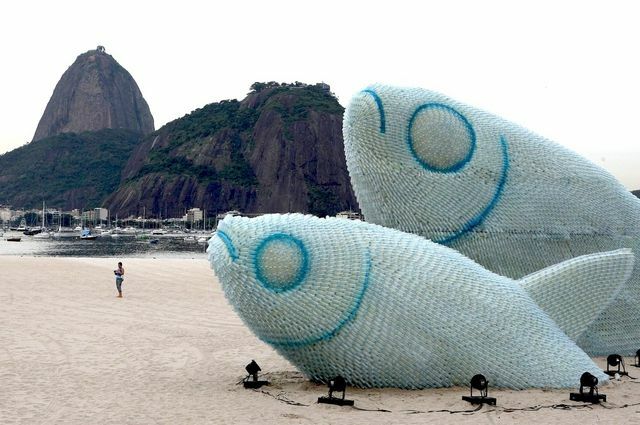 I like the idea of making a statement with empty water bottles . Something that would draw attention to our cause. I liked these fish I found. I have been interested in reading about a fungus that was discovered in the Amazon that “eats plastic”. Students at Yale are currently breading the fungus and observing it. Plastic eating fungus They are currently discussing how this fungus could be applied to the growing amount of plastic in the oceans. it can survive on “polyurethane alone and—even more surprising—do this in an anaerobic (oxygen-free)”( How ). This entry was posted on Thursday, January 29th, 2015 at 12:21 pm and is filed under Uncategorized. You can follow any responses to this entry through the RSS 2.0 feed. You can leave a response, or trackback from your own site.